Katelyn D'Onofrio is a nationally certified Nurse Practitioner. She completed her Bachelor of Science in Nursing degree at Indiana Wesleyan University, and then earned her Master of Science from University of Michigan in Ann Arbor. She is certified by the American Academy of Nurse Practitioners. 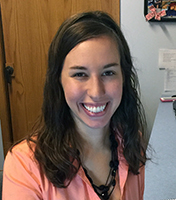 Katelyn has over 6 years combined experience as a Nurse and Nurse Practitioner. Katelyn is an accomplished and experienced clinician and is a true asset to the team.